Explanation: Mars is also known as The Red Planet, often seen with a reddish tinge in dark night skies. Mars shines brightly at the upper left of this gorgeous morning twilight view from Mornington Peninsula, Victoria, Australia, but the Moon and planet Earth look redder still. Taken on July 27, the totally eclipsed Moon is setting. It looks reddened because the Earth's umbral shadow isn't completely dark. Instead Earth's shadow is suffused with a faint red light from all the planet's sunsets and sunrises seen from the perspective of an eclipsed Moon. The sunsets and sunrises are reddened because Earth's atmosphere scatters blue light more strongly than red, creating the faint bluish twilight sky. 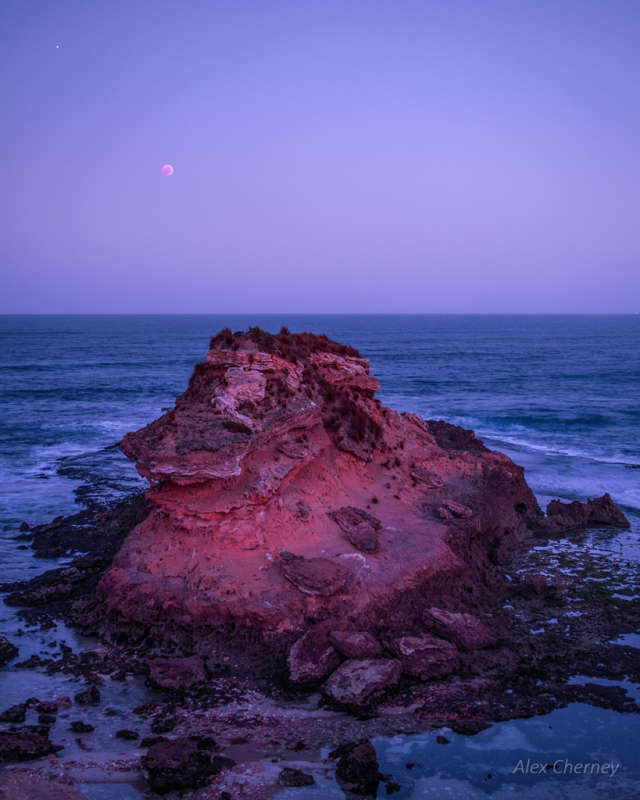 Of course, craggy seaside rocks also take on the reddened colors of this Australian sunrise.